There’s a story behind this “Curious George“-inspired piece. Perhaps some of the primary sources will speak up in the comments of this post….? If not, I’d respond to inquiries from curious parties. A 13″ x 19” (Super B) framed print of this is hanging in Maxwell’s as I write, part of the New Jersey-themed “What Exit?” exhibit. Thanks, Karl! Both this, and the Vel piece ¡eNJoy!, were drawn in Adobe Flash CS4 using my Wacom Intous3 and printed with HP Vivera inks on Hahnemühle Fine Art Premium Matte 56 lb. paper. Well, it really was quite exciting. 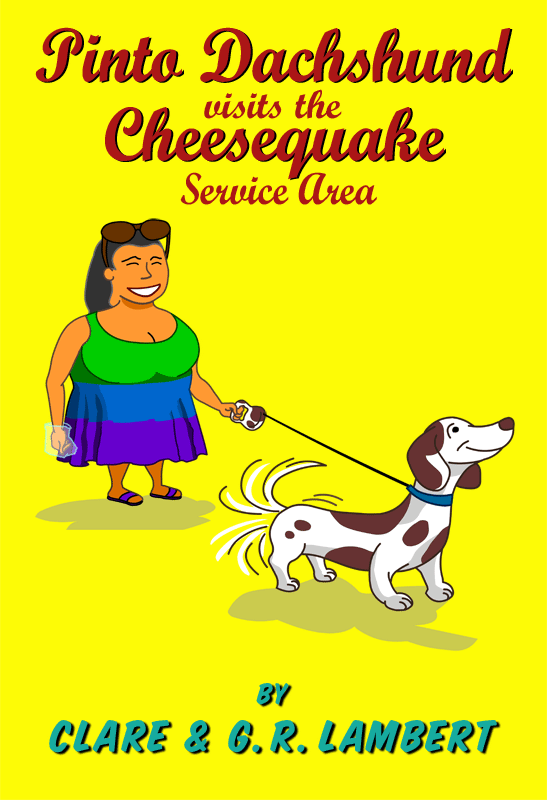 There we were, me, mom, Steve, stopping off at Cheesequake for a pit stop. And there blocking us from the door was a Pinto Dachshund! We nearly tripped over his leash. Mom was so struck with this pooch that she later made up a story that might make a lovely series of books with illustrations just like this one!